25. 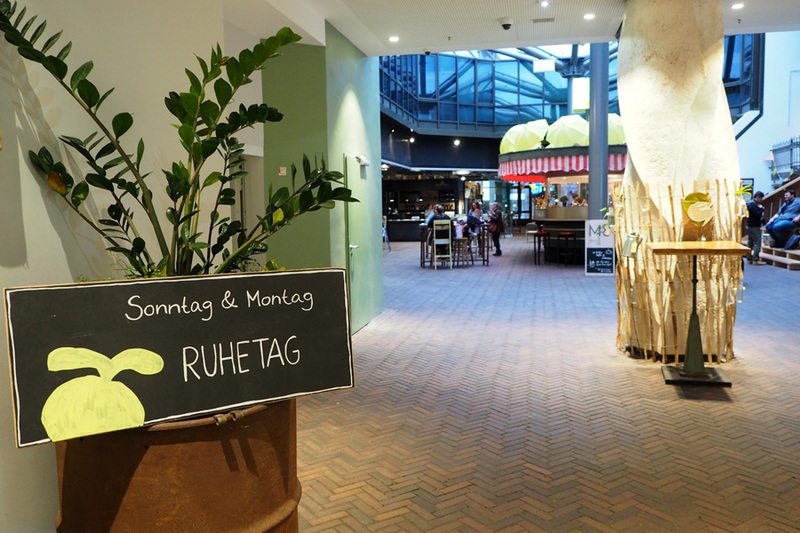 September 2017 Rike OehlerkingVisit BremenEssensmeile, Gemütlichkeit, Markthalle, Mittagspause, Streetfood..
For about a year now, Bremen has had a market hall. It isn’t really a covered market in the traditional sense though, but rather a gallery of food stalls and little restaurants that use regional produce and sustainable methods and invite you on a culinary journey around the world. I went to have a look around and found it hard to resist the temptation to have some of everything! The venue is called Markthalle Acht. It is located on Domshof square and offers a feast for all of your senses, not just the palate. As I step into the former bank building, the first thing I notice is a comfortable warmth and the mouth-watering smell of freshly made food. From the entrance, the hall stretches out in front of me and up towards the skylight in the roof. The clatter of dishes fills my ears. I find it easy to picture myself escaping from a busy day’s work to come here for a peaceful lunch break. There’s such a relaxed atmosphere that I feel my step slowing from a walk to a stroll. In the entrance area, I am greeted by a whole array of signs and blackboards. The blackboard at the entrance gives you the essentials in a nutshell. Watch out! There’s a lot to read when you enter Markthalle Acht. The pinboard gives you an overview of the stalls you will find here. I learn that the fundamental principle of the Markthalle Acht project is quality over quantity. This place is about great taste, in every sense of the word. A large pinboard at the entrance introduces visitors to the line-up of stalls waiting to spoil their taste buds. The range is so varied that you can almost eat your way around the world – from Spain and Italy on to Turkey and the Arab world, Syria and even Korea and Vietnam. I can already feel my stomach rumbling. I continue along the rows of stalls and spot a big, inviting looking stall with a red and white awning. It sits in the middle of the market hall like an oval island – an unofficial centrepiece that has only been here for a few months. It is a sausage stall, or at least it was. But not only that, it is a piece of local history. For a long time, it was set up outside the train station of Bremen and became the undisputed queen of sausage stalls in town, until it fell victim to redevelopment work in the area. Uprooted, the ‚old lady‘ found shelter in the storage facilities of the Focke Museum for a while. 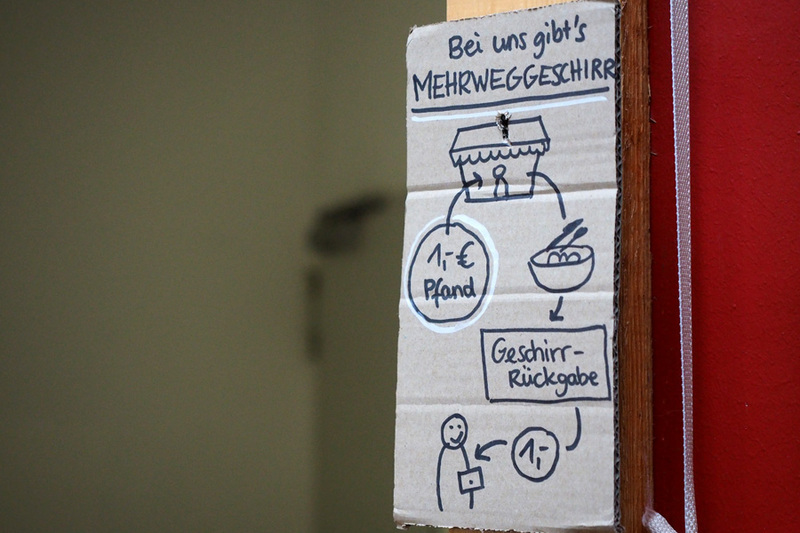 And then one lucky day, a deal was struck with the operators of Markthalle Acht. The stall was restored and – in a gigantic night-time undertaking – transported in its entirety to Domshof square and manoeuvred into the old bank building. A glance at the display counter confirms that it doesn’t sell sausages any more, but there are lots of other tasty things to choose from. It is now called M8 – Aperitivo Bar and celebrates (as the name suggests) the Italian tradition of a pre-dinner drink. 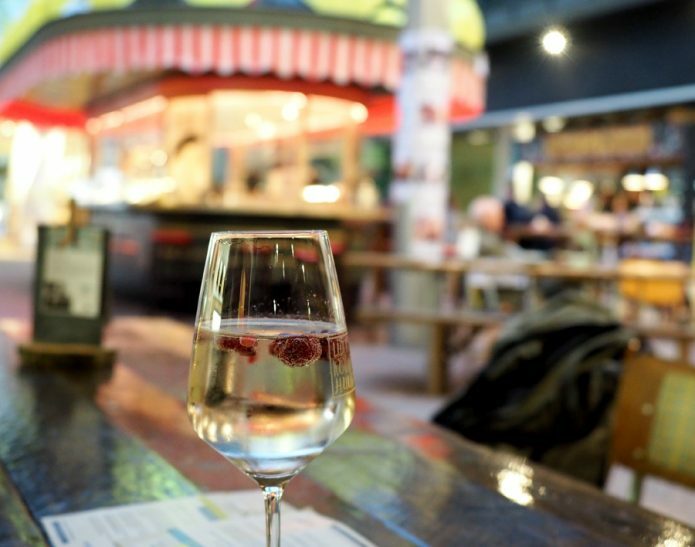 This custom is all about socialising, and as I walk around the stall, I can see a small group of people chatting cheerfully over a glass of wine. 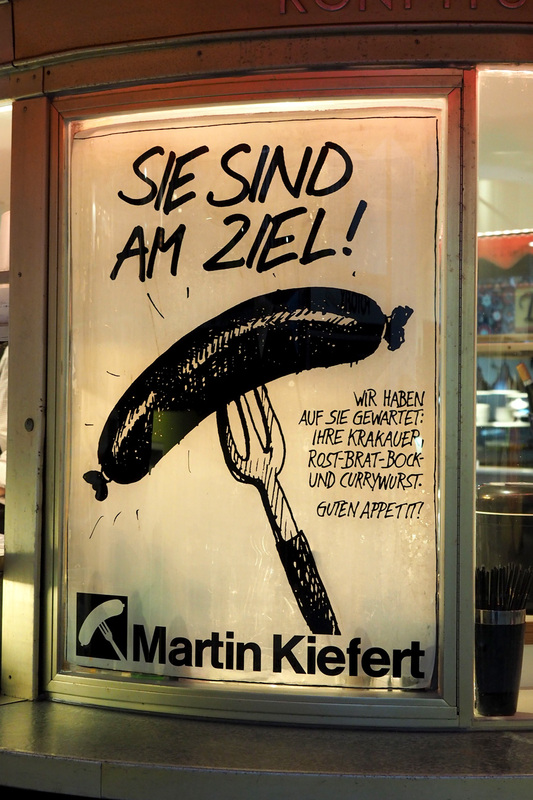 Its sausage-selling days may be over, but the Kiefert stall remains an iconic piece of Bremen’s history. After some time wandering up and down aisles full of comfy seating and colourful stalls, I settle down at Ray Gun to order a pizza. ‚Lovely Rita‘ is the name of my choice, topped with olives, tomatoes and mozzarella. And when the lovely pizza lady brings Rita over to my table on a rustic wooden board, I am smitten! The first bite confirms that this is one hell of a pizza. I’m am not a fan of hyperbole, but this delicious piece of heaven on dough is going right to the top of my leaderboard. For a moment, I switch off completely and get lost in the flavours. Yummy! 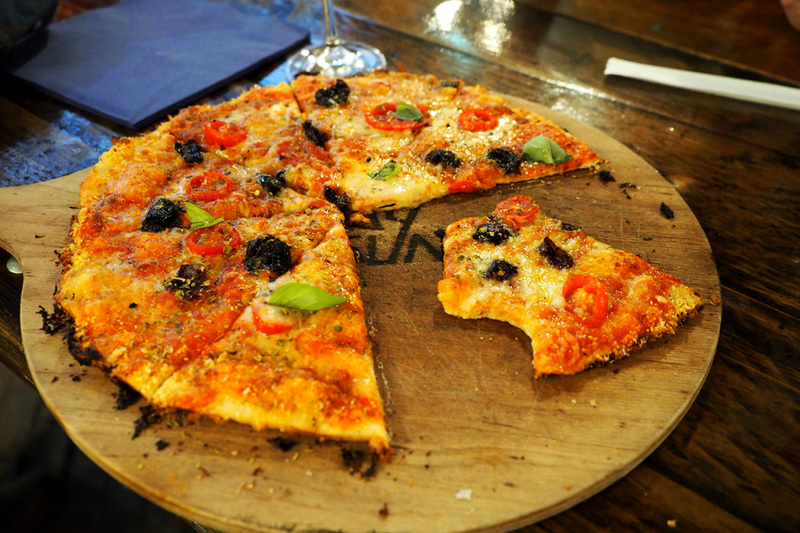 From the first bite to the last – this pizza will take some beating. 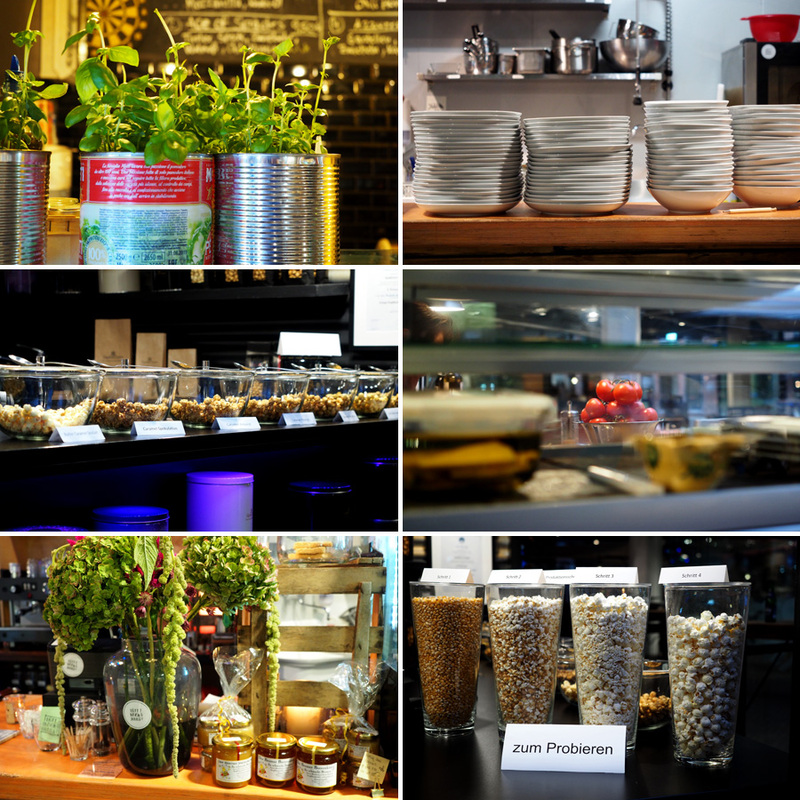 Fresh ingredients, reusable dishes and local produce – that’s what I call a sustainable concept. And for locally sourced meat try the Urban Beef Club. It’s a Wednesday evening and a fairly quiet night at Markthalle Acht. But on other days, a varied schedule of events seeks to draw the curious and hungry into this foodies‘ paradise. Thursdays, for example, are all about street food. I haven’t been myself, but have heard only good things from a variety of people. Thursday evenings also feature live music from 6pm, making this spot increasingly popular with after-work crowds. 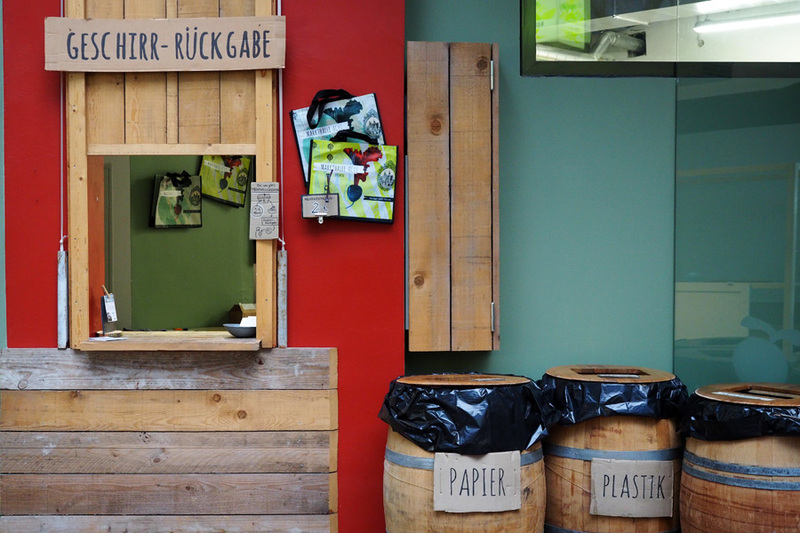 Eco-friendly thinking: The venue provides rubbish sorting facilities and reusable cutlery and crockery. I can also see announcements for other regular events on various information boards. On the third Wednesday of every month, a repairs café offers visitors an opportunity to bring in their broken items and get them fixed by friendly helpers. 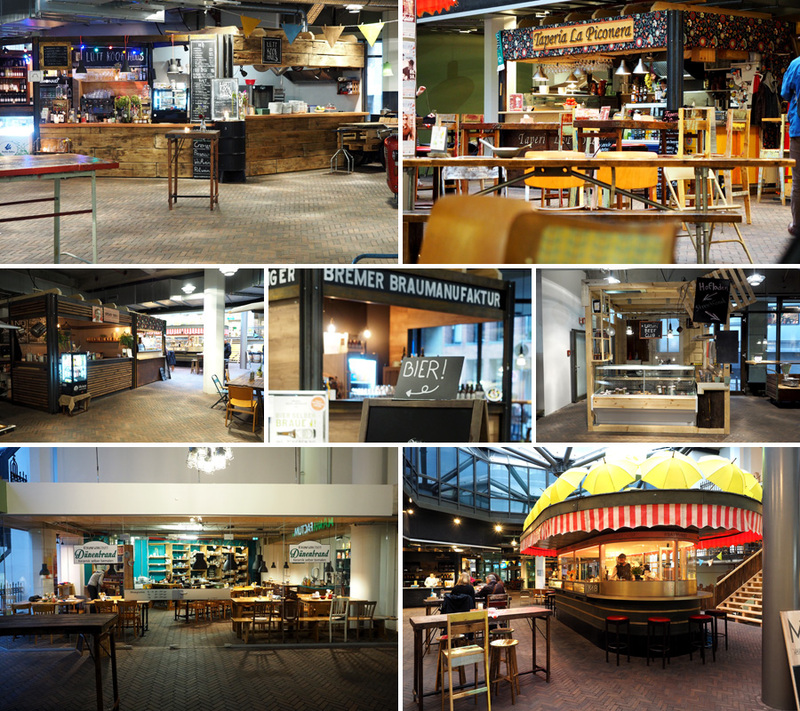 On ‚Soundkitchen‘ nights, the market hall puts on some tunes and offers a ‚walking dinner‘ pass. For a fixed price of 15 euros, you can stroll around the rows of stalls and sample any food that catches your eye. In addition, there is an array of one-off and irregular events, such as the Manufakturenmarkt, a day where small local producers and craftspeople host a ‚market within the market‘ to showcase their goods. As you can see, there are plenty of reasons to stop by every now and then. A little dim but cosy, with seasonal decorations and a cool but casual DIY flair – formerly empty halls have turned into a colourful culinary hotspot. 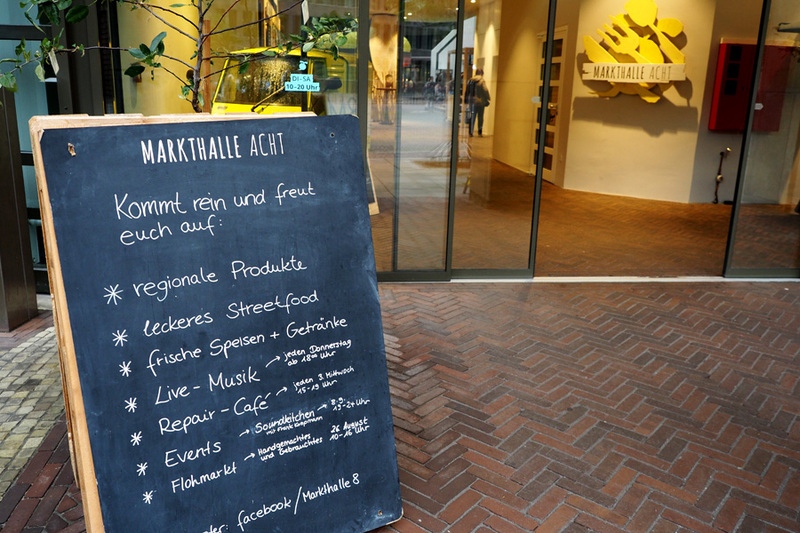 Please note: Markthalle Acht is closed on Sundays and Mondays. It is now almost 7.30pm and the last visitors of the day are getting ready to leave. The queues at the bar of Bremen’s craft beer company and at the popcorn stall have dispersed and some stalls are starting to clean up and close. I have finished my pizza and my white wine spritzer. Satisfied in all respects, I make my way towards the exit. As I step out into Domshof square, a fine drizzle settles on my face. I feel a strong urge to turn on my heel and seek shelter inside the market hall. I could happily settle down for a while longer on one of their stylish wooden benches. After a moment’s hesitation I decide against it, but I’m sure I will be back before long.